Health and fitness is a HUGE niche. Then if you niche down a little more into a specific group like the baby boomers and over 50 crowd you’ve got a market that is hungry for information. They are active and want to be healthy as well. Or maybe some of them are just now starting to experience the aches and pains of getting older and are realizing if they want to see their grandchildren grow up — they better start taking care of themselves. Millions of people in this niche are searching for ways to be active. They need guidance and there isn’t a lot of information out there. Become an expert and they will keep coming back to your site every time they need guidance. To become an expert you need a lot of content. You can write it yourself or buy the content that will help propel you into this industry quickly. By finding these you are able to set up a complete sales funnel. In the funnel you should have a front end offer that has an entry point for them – usually about $7. Then after they have purchased you can have an upsell. You can offer coaching after they have purchased the upsell as well. Map out what you’d like to offer and how the sales funnel will look. 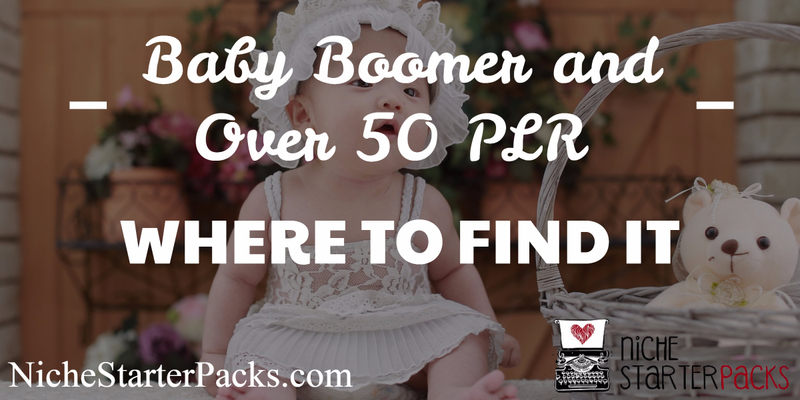 These are a list of PLR bundles that or sites that have Senior, Over 50 and Baby Boomer PLR. You can click on the links to any of these PLR packs and go directly to the sites. Or I have added a brief description of what is included in the packs below. As you can see this is a plug, promote and profit potential opportunity! Rick also has another PLR bundle geared towards seniors called Stability For Seniors PLR Mega Pack. This pack will help seniors understand if they are susceptible to falling, how to prevent it, exercise to start doing in order to help with balance and so much more. Once an accident occurs people start looking for this information. Or when someone over 50 starts to experience balance problems they will seek answers. This is a very serious subject and when people search they want answers now and will pay to understand how to get more stability. -Report – 17 Pages, 4,068 words formatted ready to add your own links and name too! This is just a small list. Some of these are specific while others you can go through and change the wording to cater to baby boomers and people over 50. -Introductory PDF – how to use your PLR pack. -20 page eBook – ‘Spring into Walking’ (5,9653 words) – sell as your own product. -Ecover in 2 styles + editable files. -Articles formatted onto slides – great for creating your own videos. -List of keywords – over 285 keywords. Keywords are listed in categories to show you which keywords are easiest to target. -Bonus Keyword list of long tail keywords – 1,000+. -30 Walking related tweets – schedule in Hoot-suite or Buffer to automate your tweets. -Spring into Walking banners – psd files included.